Sometimes a still life won't hold still. Happy Easter! 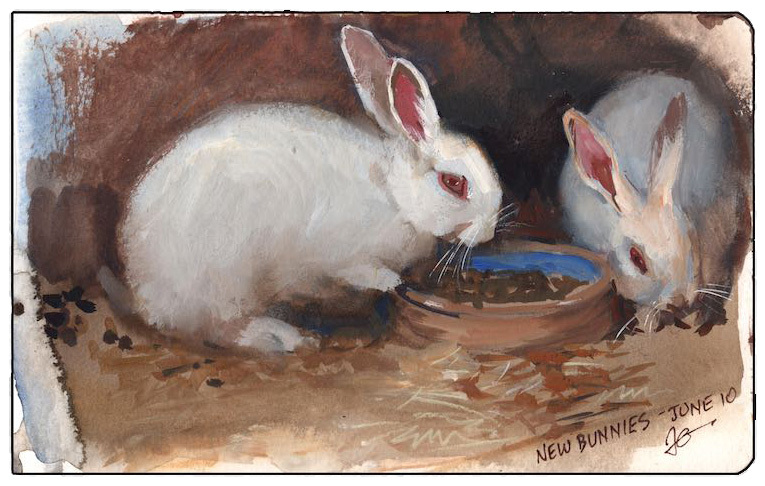 Here's a gouache sketch of some bunnies at the farm. 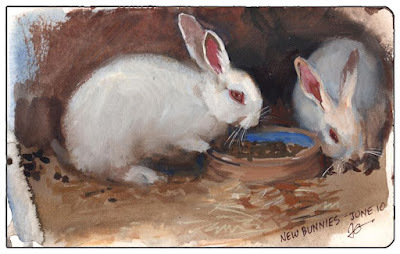 I used a special gouache technique for this one, painting into a wet, dark under-layer, which makes soft edges much easier. The bunny sketch is just one page of the Metro North app, which releases for iOS and Android phones and tablets tomorrow. It will include high-res images that you can explore in immense detail, plus custom audio and video elements, immersing you in the adventure of creating each painting. 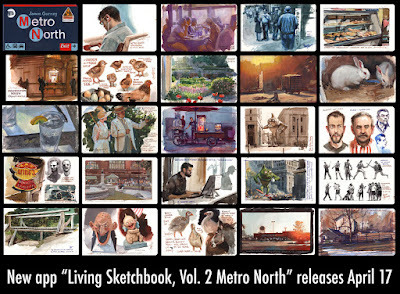 The first volume of the "Living Sketchbook" series became the top selling new app in Android's Art and Design category, and it's a must for any art lover, painting student, or sketching fan. 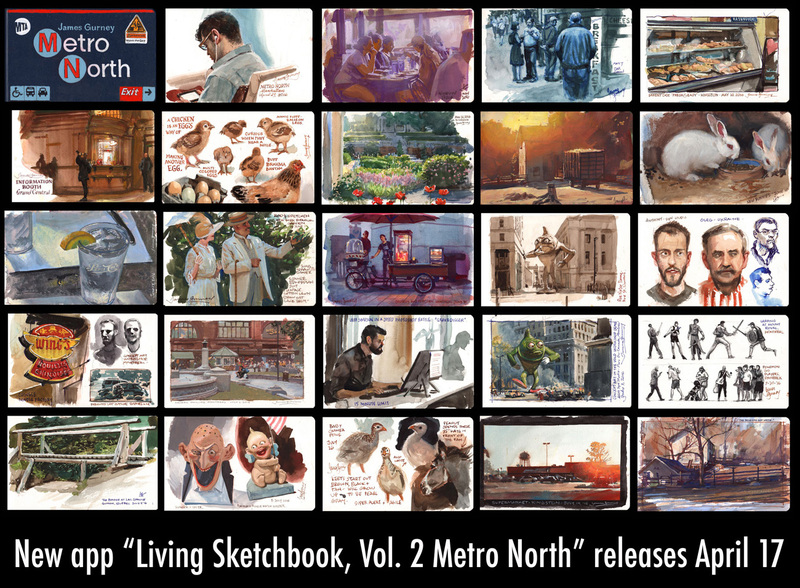 Shari Blaukopf of Urban Sketchers says: "There is a lesson to be learned with every sketch in James Gurney's The Living Sketchbook — whether it's about light, colour, materials or composition. Spending time with each sketch and being able to zoom in on them with your tablet allows you to really think about how they were created. And videos that accompany many of the sketches enrich the experience because you see the sketch develop from large colour blocks down to final details. And of course hearing James narrate his thought process — whether it be about his limited palette choices or the characters he meets while sketching — is what makes it come alive for me. It's done with warmth, humour, honesty and a vast wealth of knowledge." I have even more respect for your sketchbooks, after playing with a few tubes of casein fir a week. It's quite different than watercolor. This is so fun. I'm having a great time going through with the audio/visual. This is such an innovative idea. Thanks! Happy Easter to you and your family. Me too. This one is as good as the first one. I hope Dan makes a bunch of money so he'll keep doing it! I was just remarking to myself how few 'easter' (resurrection) images there are compared to crucifixes.. harder to visualize or something else?